This bibliography presents a review of trends in management accounting research and a classified annotated listing of over 600 works in the area. It is intended to help the accounting researcher or student who wishes to review the development of the literature in management accounting over many years. The book traces this development from 1926 to 1982 through the primary academic journals. 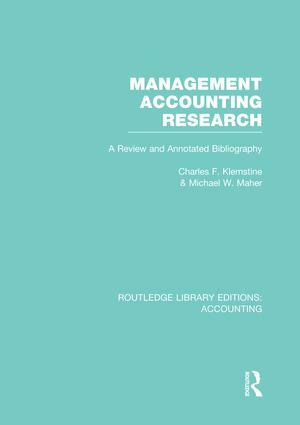 This review has focussed on accounting literature and includes only those works from outside the accounting literature that were seminal in defining and introducing a research area, and were frequently referenced in the accounting literature.